24 Tags - Sapient wisdom, bons mots, call them what you will. We just like to think of them as a great way to highlight whatever it is your pictures are already saying about your family. 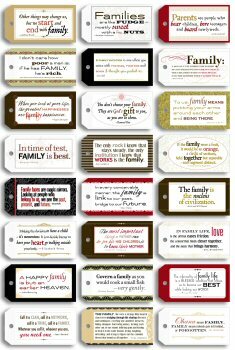 Let our charming Family Quote tags add the final touch of humor or sentiment to your projects. A must for the quintessential family album! Tags are 2 1/2" x 4 3/4"
Size: Tag Size: 2 1/2" x 4 3/4"